Stunning mother of pearl bracelet. Lacquered in a rainbow of hot vibrant colours. Randomly assembled to enhance any rich solid colours. Irresistible and wonderful to wear with absolutely anything. It is the perfect item of jewellery to take on holiday, as it will go with any monochromatic colour, hense lightening the load in the suitcase.. 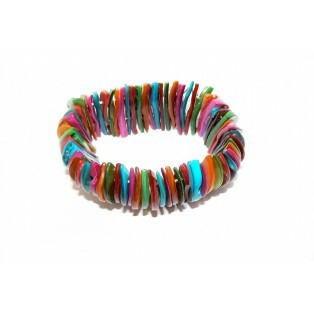 This bracelet will fit any standard sized ladies wrist as it is strung on two lengths of beading elastic. Check out the necklace and earrings too on the website to complete the set.